This creative recipe is wonderful for autumn, and what’s surprising is that it actually has no rice! 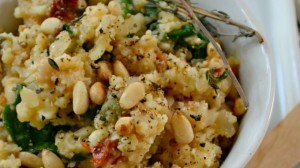 It is featured at www.ForkAndBeans.com and it showcases the versatile nature of cauliflower… and it tastes amazing! This dish serves 4, so if you want to serve it to more people just increase the quantity of ingredients. In a medium-sized pot, heat 2 Tbsp olive oil on medium heat until warmed. Place the shallots, garlic, and thyme inside and saute for 2-3 minutes or until fragrant and translucent. Place 1 the can of beans and vegetable broth into the pot and simmer for 5 minutes. Gently blend all of the contents together in the pot until creamy and smooth. If you are using a blender, return contents to the pot. Add grated cauliflower, sun-dried tomatoes, remainder beans, and spinach. Cover with a lid and allow to heat through for a good 5 minutes. Add the capers before you serve and garnish with toasted pine nuts.